A large sharp tooth, esp. a canine tooth of a dog or wolf. Also a tooth of a venomous snake, by which poison is injected. In venomous snakes, the fangs are usually folded back against the roof of the mouth, only swinging forward when needed to attack a prey. 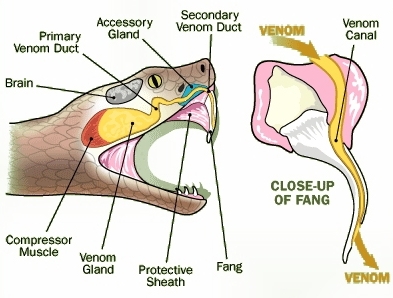 Venom stored in a sack at the back of the mouth passes along a tube to be released through a tiny hole close to the fang's point.